Gauge is relative for this project, the most important gauge for this pattern is determining your own head size before beginning as this will be the gauge as to how wide the crown circle for YOUR hat needs to be. Not hook size, not yarn size, not the number of Rnds shown in the pattern, but your own head size. Once this is determined the rest of the pattern will size correctly. Rnds 9 – 14: Ch 2, dc in each dc around, sl to into 2nd ch to join. Rnd 17. Ch 1, *work 6 dc in next sc, sc in 3rd dc of next shell, rep from * around, ignoring last sc, sl st in beg ch to join. Rnd 18: Ch 2 (counts as dc), work 3 dc in sl st, *sc in 3rd dc of shell, work 7 dc in sc, rep from * around, ending with sc in 3rd dc of last shell, work 3 dc in sl st to complete beginning shell, sl st in 2nd ch to join. Rnd 19. Ch 1, *work 7 dc in next sc, sc in 4th dc of next shell, rep from * around, ending with 7 dc, sl st in beg ch to join. Rnd 21: Ch 1, *work 8 dc in 1st sc, sc in 5th dc of next shell, rep from * around, ending with 8 dc, sl st in beg ch to join. Rnd 22: With G hook, *sc in each dc, sl st into sc, repeat from * around, sl st to end off. You know, at first this pattern seemed really daunting to me. I saw the finished product and thought, "That's gorgeous, but I'll never be able to make THAT." I started in on it, waiting for the point where I had to give up because smoke was bellowing out from my ears, like it has on so many patterns (I'm just now getting braver and better with my crocheting). But, amazingly, that didn't happen and I was able to finish a beautiful hat. I say all that to say this - thank you so much for this lovely pattern. Your directions were very clear and understandable and I really appreciate that. Sometimes the wording is so weird on a pattern, I just have to bag the whole thing because I'm so lost. I'll definitely be making more of these in the future...after my wrist stops hurting. Thanks again! Thank You so much for sharing your patterns!!! Thank you so much for sharing your pattern! It was very simple to follow, and also thank you for sharing the hat sizing tip. I've gotten halfway through (or all the way through) other patterns only to realize my finished project wouldn't work for m. I just finished mine yesterday and I love it, now I just have to wait for the cooler weather again to wear it. Hi, not sure how to contact you but I love this hat and so do a lot of my friends. I have had so many begging me to make it for them! I have basically been wondering whilst I crochet away, if I can get permission to sell the finished hat on ETSY. I will link here and give you credit of course. Lovely hat pattern and I look forward to wearing it once I have it finished! Do you have this pattern for a 6 month old baby? Thank you for this pattern. I was clueless how to do this as I am a new crocheter. I am making this for my DIL's nannie/beloved grandma whose is losing hair from cancer treatment. Thank you for sharing your pattern for free! It is an adorable hat and I can't wait to try the pattern! How do I print the pattern out or is it permissible? Thank you for sharing your patterns crochet is one of my passions the others are quilting and rag rug making. The cancer hats are beautiful. Thank you for sharing this pattern. It worked up beautifully and I love the many ways it can be styled, very versatile. hi my shells are not working - great big holes, on the single crochet then 6 dcr into single crochet something is going wrong - please help! Hello. I am at the end of Rnd 6 with 60 dc stitches in the rnd. Using a 5 mm hook. Stitches are not too loose. It looks good, and I don't want to rip anything out. My problem is that at the end of round 6, the diameter already measures just over 7 inches. Would the pattern work out if I skip rnds 7 and 8 and move ahead to rnd 9? I read the beginning of your pattern that said the number of rnds does not matter. Only the head size matters. Does that mean I can skip two rounds to keep it the right size diameter? Thank you! 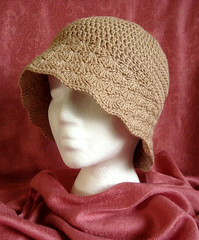 GREAT summer hat pattern! Thanks for inspiring me; I plan to start making it later today!